Miracle testimony of Jean Gordon of Ontario, The pain was overwhelming then Jesus healed my back, miracle healing stories, miracle testimonies, healing scriptures verses, Divine healing articles sermons. DO PEOPLE REALLY STAYED HEALED? DO MIRACLES LAST? YES! People do stayed healed. I am living proof that miracles do last! When the doctors had done all that they could - then DOCTOR JESUS TOOK OVER! How thrilled I am to be able to give my testimony of a miracle healing for God’s glory. And I pray that it will help other suffering people as well. What I suffered through for about six months, I would not want anyone else to have to bear. In early fall of 1996 I was helping my husband paint some 2'x6' planks which we were going to use to build our cabin. After painting them we were carrying them into the garage for storage. I probably moved about 10 of the heavy planks. Suddenly I felt a sharp pain like something snapped in my lower back. The next morning I felt more pain, but kept on working on my household duties. In the afternoon we went picking blueberries. When we got home I could hardly move. The extreme pain in my lower back went into hips & legs. I went to see my doctor and he gave me extra strong pain killers to take. Three days later I was in such pain that I could barely move. I was hospitalized to get me off my feet (which were now very swollen). When I left, my pains were even more severe so I was put on more extra strength pain killers. How my entire body ached and pained everywhere. Not just my back, hips, legs and feet, but my upper body and arms were also greatly affected. The pains shot through both arms and legs and the doctors did not know what to do. The Doctor said, "Just lie down and take the painkillers and I will arrange for you to get therapy." We had to drive one hour to Red Lake to see my therapist. Because of the terrible pain, we had to stay there overnight in a motel for each session. I took about 20 treatments, but the treatments didn't help. The therapy also pained me very much because my back was all knotted up. Finally the therapist said to me, "Well, I can't do any more for you." If I did as much as lift a little jug of water, I was in extreme pain. I was given crutches to use and my daughter came from Kenora from time to time to stay with us for a week or two, to look after me. 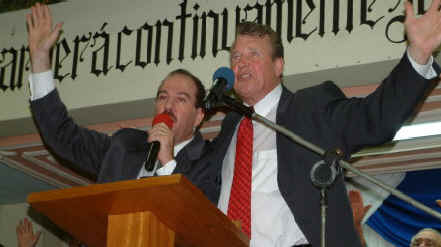 When I heard about Max Solbrekken's Revival miracle crusade in Ear Falls - February 1997 and determined that I would go. My husband Eric knew how much I suffered so he was also waiting for the miracle to happen. We had written to television evangelists for prayer and asked for prayer from other pastors and churches but I still had not been healed. THIS WOULD BE MY LAST CHANCE. I had heard of the great miracles God had performed in Max Solbrekken's ministry for so many years and I was ready to receive my miracle, when he prayed for me. WHEN PASTOR SOLBREKKEN PRAYED I FELT THE BONES MOVING IN MY BACK. When Pastor Max Solbrekken laid his hands upon me and prayed in Jesus’ Name, the bones in my back began moving. The knots disappeared and all the pain was gone. I was receiving a miracle that very instant. Thank you Jesus. How thankful I am to Jesus for His miracles and for His servant, Pastor Max Solbrekken for his prayers for me! I have never felt better in my life and I am as active as can be. I have recently been helping my husband to load and offload his big boat, with no ill effects. I praise Jesus and so does my wonderful husband, Eric. MARTIN LUTHER the great reformer said, "How often has it happened, and still does, that devils have been driven out in the name of Christ; also by calling on His Name and prayer, and the sick have been healed." JOHN WESLEY, founder of the Methodist Church, stated: "I believe that God can open the eyes of the blind, cause the lame to walk, and the deaf to hear, if men will have faith in God; stand on the word of God, and pray according to the faith that God hath given them, God will do the things He said He would because He is a never-changing God." A.B. SIMPSON, founder of Christian & Missionary Alliance, declared, "If ever there was an age where the world needed the witness of God's supernatural working, it is in this day of unbelief and Satan's power." "Therefore, we may expect, as the end approaches, that the Holy Ghost will work in the healing of sickness, in the casting out of demons, in remarkable answers to prayer, in special and wonderful providences, and in such form as may please His sovereign will to an unbelieving world." Dr. CHARLES H. MAYO, Mayo Brothers Clinic, said: "Christian healing has passed beyond the stage of experience and its value cannot be questioned. Spiritual healing is no longer the hope of a few but the belief and practice of a large and rapidly increasing number of person." MAX SOLBREKKEN, God's humble servant, says: "That God is a healer is no secret. That his Word has amazing saving, healing and creative power is well known. But that his power to save, heal and deliver is readily available at absolutely NO COST, is not widely known." Most people believe that there are strings attached, a price to pay, good works to do, a guru to follow, and that God favors only a few. Divine healing is a gift from God to those who are fearful, hurting, sick and diseased. And He offers it freely through the death & resurrection of His Son Jesus Christ, by Whom He has defeated sin, sickness, fear, death & Satan. GLORY TO GOD FOREVER. I wish to thank my Heavenly Father for His grace, goodness and mercy toward me and for the many years that He has given me life, health & strength to continue in His vineyard! I thank my precious Saviour Jesus Christ for the outpouring of the Blessed Holy Spirit upon this ministry and the staggering miracles which He has performed for the glory of Almighty God. This little booklet was written in 1965 - only 2 years after I had entered the ministry - and brought the healing message of Jesus Christ to multitudes. It was titled, "HOW TO RECEIVE HEALING FROM JESUS CHRIST." Numerous miracles of divine healing and deliverance have been wrought by our blessed Lord Jesus through this ministry, during the past four decades. The truths found in this message are still basic and necessary for each of us, if we are to experience the presence of the Holy Spirit which brings the healing virtue of Jesus Christ into our lives. God does answer prayers, but He knows the best time and the best solution for each of us. Without doubt, God is still as interested in the human family as ever and His Word is still true and "by His stripes we are healed." No one can change that~ God proves His great love to us by forgiving our sins and healing our sicknesses, and answering our prayers, as Dr. A.B. SIMPSON, founder of Christians & Missionary Alliance - concurred many years ago in his powerful book, "The Gospel of Healing." God is our kind and caring Heavenly Father, and it has been my joy to see his hand outstretched toward the sinful, sick and suffering these many years. Over the years we have seen thousands of prayers answered and glorious miracles of healing in bodies, lives and families. All glory and praise to His wonderful name, through Jesus Christ our Lord. It is my prayer that as we reprint this little "messenger of hope", faith will rise in many hearts, faith that God will fulfill his word and answer your prayer. I pray that great blessings will touch multitudes of lives. Multitudes today are suffering from a disease or infirmity with no relief in sight. They have frequented doctors, clinics and hospitals with little or no help - and are discouraged, angry and bitter! Some have prayed earnestly regarding their healing, had special prayer in their church by the pastor and elders or by an evangelist whom God uses to bring healing to the sick through faith in Jesus Christ - and still are not healed! Many become discouraged thinking that God is not listening to their prayers or that they are not important enough for him to give them answers to their prayers. Possibly someone reading this booklet fits one of these categories. After your hospital visit or prayer service, you are “not better”. You may even be getting worse! Your faith is at a low ebb and you’re tired of being tired, sick and defeated. You are tired of hoping and believing without any answers to your prayers. You feel like throwing up your hands in despair since nothing helps, and accept weakness, pain, sickness and distress as your lot in life! MY DEAR FRIEND, THERE IS STILL HOPE FOR YOU. It is not too late. It may seem hopeless, but it is not. It may seem useless to think of deliverance, but it is not. So long as you are alive and there is a God in Heaven, there is hope! 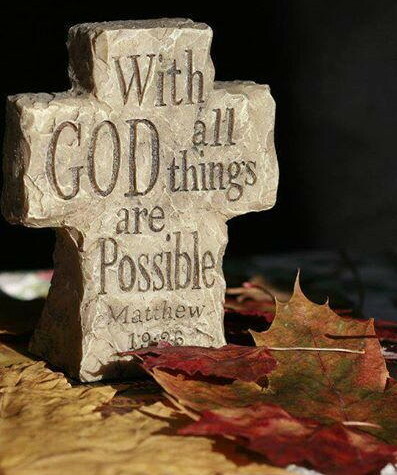 The Bible says, “With men this is impossible, but not with God, for with God all things are possible”. (Mark 10:27) It may seem impossible to you but with God NOTHING is impossible. Man’s extremity becomes God’s opportunity. And when man fails, that’s when God can take over, for He never fails. When man “gives up on you”, God is ready, willing and able to step in and bring to pass a miracle in your life, because nothing is impossible with Him! GOD CAN & WILL ANSWER YOUR PRAYER! When God could bring the world into being by His spoken Word, hang the universe on nothing, fling the sun, moon and stars into the far most corner of the night to rotate in perfect harmony, HE CAN ANSWER YOUR PRAYER. You must be patient and continue to pray and seek God, as he will answer your prayers when he feels the time is right. "By the Word of the Lord were the heavens made; and all the host of them by the breath of His mouth." (Psalm 33:6). Since He has the ability to create millions of moons, galaxies of stars and heavenly bodies by a few words from Hs lips, most assuredly He is able to destroy the cancer, heart disease, diabetes or arthritis which is stealing your health. WHEN AT THE TOUCH OF HIS HAND, GOD CREATED A PERFECT HUMAN BEING IN HIS OWN IMAGE AND BREATHED INTO MAN’S NOSTRILS THE BREATH OF LIFE MAKING HIM A LIVING SOUL, SURELY HE CAN HEAL YOUR SICK SPIRIT, SOUL (MIND) AND BODY. HE HAS PROMISED HEALING, GOD HAS PROMISED ANSWERS TO YOUR PRAYERS. The Great God Who brought back to life the Lord Jesus Christ, can certainly quicken your mortal body. When you think of how great and mighty our God is, certainly nothing could be impossible to Him! Is God able to heal our weak, aging, temporal bodies? Yes, He is able to and He does! Is God able to answer your prayers. Yes - He is willing to answer your prayers. The Bible says, “All things are possible to him that believeth”. (Mark 9:23) Since He (the Holy Spirit) brought Jesus Christ back from the dead, He can most certainly heal our diseased and dying bodies, says St. Paul. In verse 26, the great apostle continues, "Likewise the Spirit also helpeth our infirmities (lit. greek - takes a hold of against our sicknesses): for we know not what we should pray for as we ought: but the Spirit itself (Himself) maketh intercession for us (lit. greek - and together with us) with groanings (Holy Spirit prayer - praying in tongues) which cannot be uttered". The same Blessed Holy Spirit Who raised Jesus Christ from the dead dwells within us and "takes a hold of against our sickness" and “together with us” prays to our Heavenly Father for our healing and deliverance! "ALL THINGS ARE POSSIBLE TO HIM THAT BELIEVETH"
The Bible says, “All things are possible to him that believeth”. (Mark 9:23) The first truth we have established is that your case is not too difficult for God and there is a good possibility of your healing to take place We have also established that God is able and willing to heal you - to answer your prayers! THE BIBLE STATES THAT JESUS CAME TO BRING LIFE! Jesus stated that the devil came for only three reasons; to steal, kill and destroy! But Jesus came to bring life! The devil is a thief and a murderer (John 8:44) and came only to do evil (steal, kill and destroy). He came to rob you of your happiness, joy, peace, health and blessing. He came to harm you and finally destroy you in a hospital, insane asylum or prison. The devil is cruel, perverted, evil, wicked and ungodly. He can only do evil. He has no capability to do good. The devil is the death giver! JESUS IS 100% GOOD! He came to bring life. He came to bring blessings to all who would believe. HE CAME TO BRING ABUNDANT LIFE BECAUSE HE IS THE LIFE GIVER! Some people have given the devil the credit for healing sick people - this is blasphemous and utterly false. It is contrary to God’s Word and accuses Jesus of telling an untruth. We know that Jesus is the truth, the life and the way (John 14:6). The Word of God is pure, divine and infallible! JESUS SAID THAT YOU CANNOT GET GOOD FRUIT FROM A CORRUPT TREE OR CORRUPT FRUIT FROM A GOOD TREE. By their fruits we shall know them! Jesus said a corrupt tree “bringeth not forth good fruit”. (Matthew 7:18) It is against the law of a thorn tree to bring forth figs - you can’t get sweet water out of a fountain that is bitter. HOW COULD THE DEVIL, WHO IS COMPLETELY EVIL, BRING FORTH SOMETHING THAT IS GOOD? Jesus called the devil a thief who came only to steal, kill and destroy. He came to this earth for no other purpose! Jesus came to bring life! Healing and health is life! Sickness and disease brings death! The Bible classifies 'healing' as 'doing good'! Oh I know there are times that it appears witch doctors and other occultists may have affected cures by their incantations. Do not be deceived. Satan is a deceiver and manipulator. In the end, his involvement always brings enslavement, torment & death. The magicians (witch doctors and soothsayers) of Egypt could duplicate many of the miracles performed by Moses in the sight of Pharaoh (king) of Egypt. There were two things they could not do, however. 1 - They could not get rid of the plagues even though they could duplicate Moses in bringing forth the flies and frogs. Moses had to be called to get rid of the plagues: eg. darkness, flies, frogs, lice, locusts. Interpretation: Satan can bring the cancer but he has no power to heal the person from the death-dealing work of the disease which he has brought. God is the only healer and restorer! 2 - When it comes to creating life, the magicians could not create lice out of dust as Moses did in the Name of the Lord. The magicians said to Pharaoh, “This is the finger of God”. (Ex. 8:19) Here is the interpretation: Satan is a deceiver and trickster but he has no power to do good, heal, save or create life! All he can do is deceive, lie, steal and kill! Only God can heal and create life and sustain it! There are some things you must do if you are to be healed. Study the accounts of sick folk - in the Bible - who were healed, and if you do what they did, you will certainly receive healing, because Jesus Christ is no respector of persons! No. 1 - WORSHIP JESUS CHRIST! There is only ONE HEALER, Jesus Christ. He alone is the Great Physician. Seek Him and worship Him, and turn from every known sin. Seek the Healer and not the healing! Focus your attention on Jesus. Worship, praise and magnify His Name and His love, forgiveness and healing will automatically flow into you! By seeking God through Jesus Christ, you will establish a vital contact with the Great Physician and receive your miracle and answers to your prayers. People who seek only a healing or a miracle or answers to prayers without worshipping God, will be greatly disappointed. ALWAYS REMEMBER, KNOWING GOD THROUGH JESUS CHRIST AND THE BLESSED HOLY SPIRIT - WITHOUT BEING HEALED PHYSICALLY - IS FAR MORE ADVANTAGEOUS THAN GETTING ONLY A PHYSICAL MIRACLE WITHOUT RECEIVING JESUS CHRIST AS SAVIOUR AND LORD! Jarius was in a desperate situation. His daughter was at the point of death when he decided to seek out the Master. Here is the Bible account. “And, behold, a woman, which was diseased with an issue of blood twelve years, came behind Him, and touched the hem of His garment: For she said within herself, If I may but touch His garment, I shall be whole. But Jesus turned Him about, and when He saw her, He said, Daughter, be of good comfort; thy faith hath made thee whole. And the woman was made whole from that hour. “And, behold, a woman of Canaan came out of the same coasts, and cried unto Him, saying, Have mercy on me, O Lord, thou son of David; my daughter is grievously vexed with a devil. But He answered her not a word. And His disciples came and besought Him, saying, Send her away; for she crieth after us. But He answered and said, I am not sent but unto the lost sheep of the house of Israel. “Then came she and worshipped Him, saying, Lord, help me. Without doubt, God hears your prayers and God answers the prayers of those who worship Him. And all who are saved and healed by God’s power WILL desire to worship Him! The blind man whom Jesus healed is a good example of that fact: “Jesus heard that they had cast him out; and when He had found him, He said unto him, Dost thou believe on the Son of God? He answered and said, Who is He, Lord, that I might believe on Him? And Jesus said unto him, Thou hast both seen Him, and it is He that talketh with thee. No. 2 - HUMBLE YOURSELF! Pride is a gigantic hindrance to receiving divine healing! “But He answered and said it is not meet to take the children’s bread, and to cast it to dogs. Here is the account of a Canaanite woman humbling herself in the sight of God. When she did, Jesus granted her request! Her daughter was healed! “So Naaman came with his horses and with his chariot, and stood at the door of the house of Elisha. And Elisha sent a messenger unto him, saying, Go and wash in Jordan seven times, and thy flesh shall come again to thee, and thou shalt be clean. “But Naaman was wroth, and went away, and said, Behold, I thought, He will surely come out to me, and stand, and call on the name of the Lord his God, and strike his hand over the place, and recover the leper. Are not Abana and Pharpar, rivers of Damascus, better than all the waters of Israel? may I not wash in them, and be clean? So he turned and went away in a rage. “And his servants came near, and spake unto him, and said, My father, if the prophet had bid thee do some great thing, wouldest thou not have done it? how much rather then, when he saith to thee, Wash, and be clean? Many people believe that they will receive something from God because of WHO THEY ARE OR THINK THEY ARE! We do not receive healing because we are worthy, but because we are needy. And Jesus Christ met that need nearly 2000 years ago on the cross! It is only because of His great liberality to us by sending His Son Jesus Christ, to die in our place and purchase our salvation, that we receive forgiveness and divine healing from His gracious and loving land! We must never forget that forgiveness, divine healing, the gifts and graces of God which He bestows upon us are simply that - gifts of God’s mercy to us! Believe that God’s Word is absolutely true and that it will never pass away! The Heavens and the Earth will pass away, but God’s Word will stand forever. (Matthew 24:35) God’s Word is as pure and divine as God Himself (John 1:1-4). THE HOLY SCRIPTURES IS GOD’S WORD! The Lord God Almighty is “back of” His Word, and it will never fail (1 Kings 8:56). God has placed “His Word” above “His Name” (Psalm 138:2). His Word has gone out of His mouth in righteousness and will not return void. God will perform every Word He has spoken. “Then said the Lord unto me, Thou hast well seen: for I will hasten My word to perform it.” (Jeremiah 1:12) “So shall My word be that goeth forth out of My mouth: it shall not return unto Me void, but it shall accomplish that which I please, and it shall prosper in the thing whereto I sent it.” (Isaiah 55:11) Believe that God’s Word is the final authority and that IT IS GOOD TODAY! Then, appropriate His Word to yourself, for your own individual need! The Bible says, “So then faith cometh by hearing, and hearing by the Word of God.” (Romans 10:17) Jesus asked two blind men, “Believest thou that I am able to do this (heal them)?” They answered, “Yea, Lord”. Then Jesus touched their eyes saying, “According to your faith be it unto you”, and they were instantly healed! No. 4 - TAKE GOD AT HIS WORD! Seven hundred years before His birth in Bethlehem, the Holy Spirit promised divine healing through the Coming Messiah! These three laws, when acted upon in faith, bring divine healing and total deliverance to those who call upon the Lord in sincerity and trust! “Verily I say unto you, Whatsoever ye shall bind on earth shall be bound in heaven: and whatsoever ye shall loose on earth shall be loosed in heaven. For a full treatment of this subject, write for booklet on ‘The Laws of God & Divine Healing’! Confess to the Lord that you Believe His Word and that you Know He is your Healer! Concur with the Scriptures. Agree with Jesus Christ, that you Accept His promises as true and infallible! Confess to Him that you Believe that “By His Stripes you are Healed”. Then, Thank Him for healing you and for answering your prayers. Trust the Lord for complete deliverance. Relax and get well for according to His Word, He has healed you. Jesus said, "Therefore I say unto you, what things soever ye desire, when ye pray, believe that ye receive them, and ye shall have them". (Mark 11:24) Jesus Christ promises that he will hear and answer your prayers. YOU MAY RECEIVE AN IMMEDIATE ANSWER TO YOUR PRAYERS. YOU MAY BE HEALED SUDDENLY OR YOU MAY BEGIN TO AMEND AS ALSO HAPPENED IN THE MINISTRY OF OUR LORD JESUS CHRIST! READ WITH JOY THESE WORDS OF LIFE: “Is any sick among you? let him call for the elders of the church; and let them pray over him, anointing him with oil in the name of the Lord. And the prayer of faith shall save the sick, and the Lord shall raise him up; and if he have committed sins, they shall be forgiven him. You may receive divine healing in one of various ways - through the laying on of hands, anointing with oil, prayer of agreement or praying alone to our Heavenly Father in Jesus’ dear Name, in your home! Give God all the glory. Share with others what God has done so that you may rejoice together and glorify the Name of Jesus. Remember, Jesus said in Mark 9:23 - “ALL THINGS ARE POSSIBLE TO HIM THAT BELIEVETH”. Allow me now to offer a prayer to God on your behalf. “Kind Heavenly Father, I pray in Jesus’ Name that you will extend Your hand of mercy, forgiveness and divine healing right now to each and everyone who is reading this booklet. “Upon the authority of God’s Word, by the blood of the everlasting covenant, through the eternal Spirit of God and in Jesus’ all powerful Name, I command Satan to take his hands off each one reading this booklet now! “Every evil spirit of torment, infirmity and unrighteousness must leave NOW, in Jesus’ Name. THANK YOU LORD. I BELIEVE IT IS DONE AND I PRAISE YOU IN JESUS' HOLY & PRECIOUS NAME." Amen. I ask for Thy great mercy and grace. I acknowledge my sinfulness and confess that I cannot save myself. I believe the GOOD NEWS that Jesus paid the penalty for m sins, through His vicarious death on the cross." "I believe that Jesus Christ rose from the dead according to the Scriptures and He has the power and authority to forgive my sins and save my soul. I repent of my sins and am willing to forsake them with the help of the Holy Spirit." "I now renounce the devil and all his works and all his ways and I now receive Jesus Christ as Lord and Saviour, my Master and my God. Come into my heart and save me now, for Christs' sake. Thank you Lord, for saving my soul. In Jesus precious' name, I pray." Amen. Matthew 18:18 - (kjv) - "Verily I say unto you, That if two of you shall agree on earth as touching any thing that they shall ask, it shall be done of My Father which is in heaven." Matthew 18:19 - (kjv) - "Again I say unto you, That if two of you shall agree on earth as touching any thing that they shall ask, it shall be done of My Father which is in heaven." Matthew 18:30 - (kjv) - "For where two or three are gathered together in My name, there am I in the midst of them." Exodus 15:26 - (kjv) - "And said, If thou wilt diligently hearken to the voice of the LORD thy God, and wilt do that which is right in his sight, and wilt give ear to his commandments, and keep all his statutes, I will put none of these diseases upon thee, which I have brought upon the Egyptians: for I AM the LORD that healeth thee." Hebrews 12:12-13 - (kjv) - Wherefore lift up the hands which hang down, and the feeble knees; ..And make straight paths for your feet, lest that which is lame be turned out the the way; but let it rather be healed. James 5:14-16 - (kjv) - "Confess your faults one to another, and pray one for another, that ye may be healed. The effectual fervent prayer of a righteous man availeth much." Psalm 37:5 - (kjv) - The Bible says, "Commit thy way unto the Lord; trust also in Him; and He shall bring it to pass." Mark 11:24 - (kjv) - Jesus said, "Therefore I say unto you, what things soever ye desire, when ye pray, believe that ye receive them, and ye shall have them." Matthew 7:7-8 - (kjv) - "Ask, and it shall be given you; seek, and ye shall find; knock, and it shall be opened unto you: For everyone that asketh receiveth; and he that seeketh findeth; and to him that knocked it shall be opened." Romans 8:11 - (kjv) - "But if the Spirit of Him that raised up Jesus from the dead dwell in you, He that raised up Christ from the dead shall also quicken - make life in - your mortal (temporal, dying) bodies by His Spirit that dwelleth in you." Romans 8:26 - (kjv) - Likewise the Spirit also helpeth our infirmities: for we know not what we should pray for as we ought: but the Spirit itself maketh intercession for us with groanings which cannot be uttered. Romans 8:27 - (kjv) - And he that searcheth the hearts knoweth what is the mind of the Spirit, because he maketh intercession for the saints according to the will of God. Romans 8:28 - (kjv) - And we know that all things work together for good to them that love God, to them who are the called according to his purpose. Exodus 15:26 - "And said, If thou wilt diligently hearken to the voice of the LORD thy God, and wilt do that which is right in His sight, and wilt give ear to His commandments, and keep all His statutes, I will put none of these diseases upon thee, which I have brought upon the Egyptians, for I am the Lord that healeth thee." Matthew 7:7-8 - (kjv) - Jesus promised: "Ask, and it shall be given you; seek, and ye shall find; knock, and it shall be opened unto you: For every one that asketh receiveth; and he that seeketh findeth; and to him that knocketh it shall be opened." Proverbs 4:20-22 - (kjv) - My son, attend to my words; incline thine ear unto my sayings... Le4t them not depart from thine eyes; keep them in the midst of thine heart...For they are life unto those that find them, and health to all their flesh. 3 John 1:2 - (kjv) - Beloved, I wish above all things that thou mayest prosper and be in health, even as thy soul prospereth. Matthew 8:16-17 - (kjv) - "When the even was come, they brought unto Him many that were possessed with devils: and He cast out the spirits with His word, and HEALED ALL THAT WERE SICK: That it might be fulfilled which was spoken by Esaias the prophet, saying, Himself took our infirmities, and bare our sicknesses." Matthew 14:34-36 - (kjv) - And when they were gone over, they came into the land of Gennesaret...And when the men of that place had knowledge of him, they sent out into all that country round about, and brought unto him all that were diseased,...And besought him that they might only touch the hem of his garment: and as many as touched were made perfectly whole.